This custom wrap was a specialty made item that we may have to reorder it is so cool. It can be available for any color or wrap type. It consists of a solid black base with a 30% satin sheen topcoat with a hint of metallic, so it is not completely a matte finish and the metallic hint adds a bit of silvery glisten and contains a unique scratch resistance. 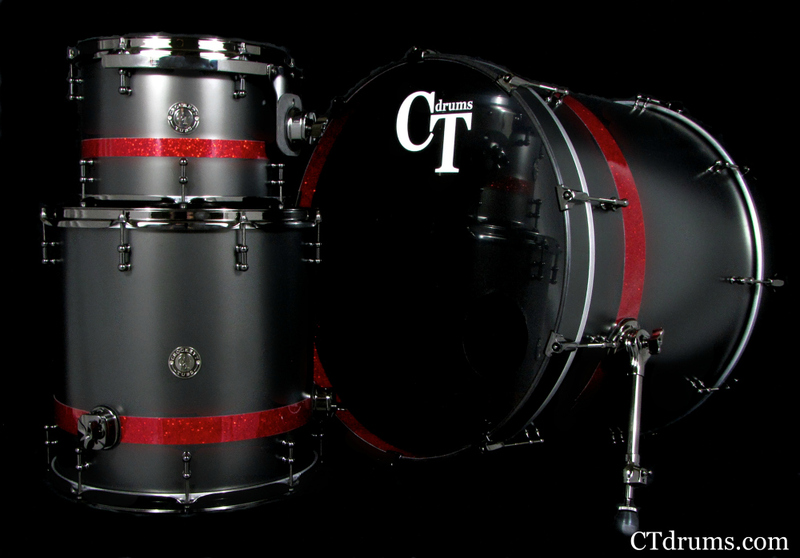 Each drum has an offset red glass glitter stripe that is tightly butted up against the black and with a proportionately sized stripe per drum size. Tying the whole kit together, we added internal red glass on the inside of both bass drum hoops while we stained the wood edges with all black satin stain. Our all black nickel hardware fits perfectly, including 50% offset mini 1″ tube lugs, 2.3mm triple flanged hoops, pro spurs, heavy duty hinged brackets, 12″ DSS mount, and matching die cast claws. This Standard Series maple kit has a thunderous 20×24″ kick, 9×12″ tom, and a 16×16″ floor. A very cool kit for Mic Rawls who is already hitting the streets with his 3 bands. 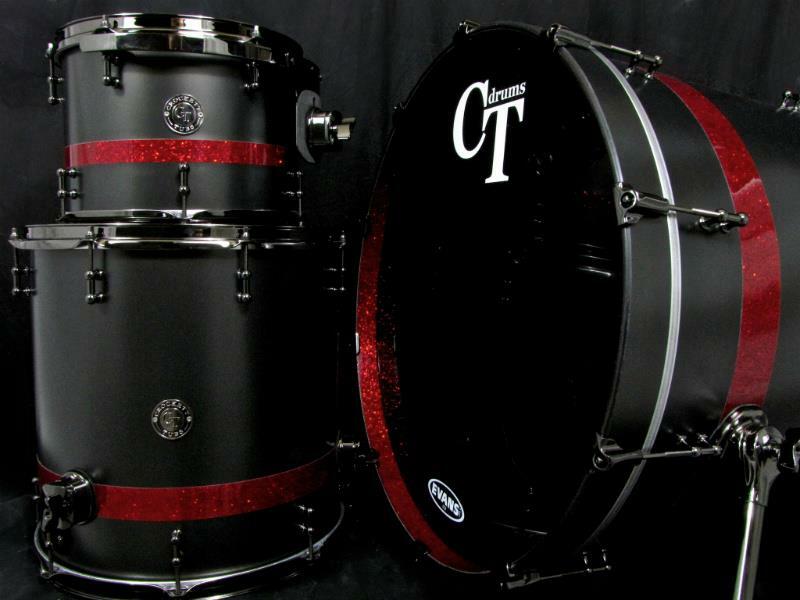 Posted on October 27, 2011, in Kits, Standard Series, Unique Builds and tagged 16x16" 9x12", 20x24", 50% offset, black nickel hardware, maple, red glass glitter, satin black, standard series, stripe, wrap. Bookmark the permalink. Leave a comment.